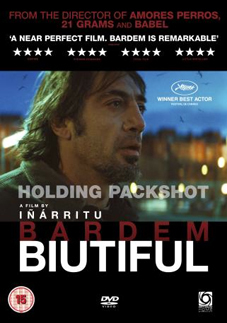 Oscar-nominated for Best Foreign Language Film and Best Actor for Javier Bardem's towering performance, Biutiful is the latest film from Mexican auteur Alejandro González Iñárritu (Amores Perros, 21 Grams), and tells the story of a man who struggles to reconcile fatherhood, love, spirituality, crime, guilt and mortality amidst the dangerous underworld of modern Barcelona. Uxbal (Javier Bardem – No Country For Old Men, Vicky Cristina Barcelona) is a man with a bright side and a dark side. On the one hand a caring father, strong but affectionate towards his two children, he struggles to maintain a healthy relationship with their mother, Marambra (Maricel Álvarez), despite her problems with alcohol and instability. But Uxbal is also a criminal who oversees a small underground empire alongside his impulsive brother Tito (Eduard Fernández) and fellow crime boss Hai. Uxbal's dealings range from drugs to construction, but unlike his partners, he tries to treat those around him with dignity even as he trades in human misery. Uxbal's precarious world begins to collapse when he's diagnosed with a serious illness and told he has only a few weeks left to live; he comes to consider what his life will mean for the legacy he leaves his children, and sets about trying to make a better life for them before he departs. Biutiful will be released on UK DVD and Blu-ray on 16th May 2011 by Optimum Home Entertainment at the RRP of £17.99 for the DVD and £22.99 for the Blu-ray.